A highly sought-after RCA shaded dog Living Stereo title, the performance and sonics found within these two classic albums rate a 10/10. Led by conductor Fritz Reiner and performed by the Chicago Symphony Orchestra, this is a must have — the dynamics are monstrous! 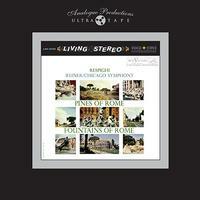 Whichever other Respighi tone poem recordings you ultimately purchase, you MUST own this one. Since the early ‘60s it has been the standard by which all others have been judged, and in terms of both sound and performance, it has never really been surpassed. The final March of Pines is simply incredible: Thundering bass drum, crashing cymbals and gongs, bellowing brass — nobody since has brought the whole thing off with the same combination of excitement and discipline. The remaining titles include: Rickie Lee Jones' It's Like This / Rachmaninoff's Symphonic Dances (the famous Turnabout recording) / Fritz Reiner and the Chicago Symphony Orchestra's Scheherazade (RCA Living Stereo) / Hugh Masekela's Hope / Leopold Stokowski's Rhapsodies (RCA Living Stereo) / René Leibowitz and the Royal Philharmonic Orchestra The Power of The Orchestra (RCA Living Stereo) / Fritz Reiner and the Chicago Symphony Orchestra's Lieutenant Kije and Stravinksy's Song of the Nightingale (RCA Living Stereo) / Abel /Steinberg - Beethoven Violin Sonata (Wilson Audio) / and Lowell Graham's Winds of War & Peace (Wilson Audio). Have we ever heard a fundament from hifi like this? The soundstage is huge and natural clear, you pick every instrument there, sounding as natural as you would have experienced them in a music hall. The air between the instruments and the movement in the music is what making tape the no.1 reproducer of recorded music, this wonderful feeling of no limits. I will for sure be back for more tapes and really hope that we will see more titles to come. from AP. Thanks!